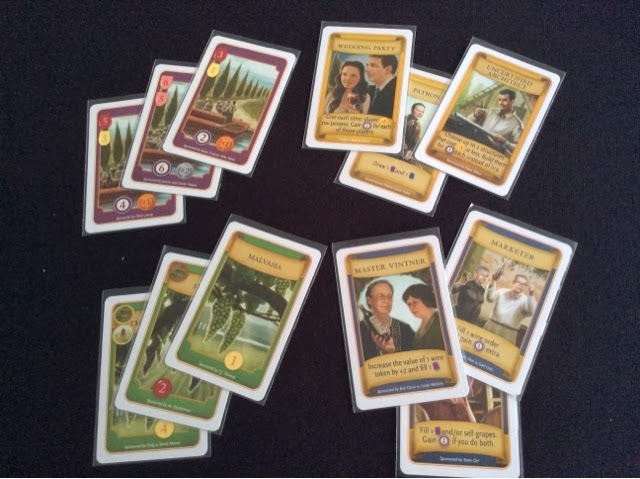 Viticulture is a game about running a vineyard and turning it into a booming winery business. 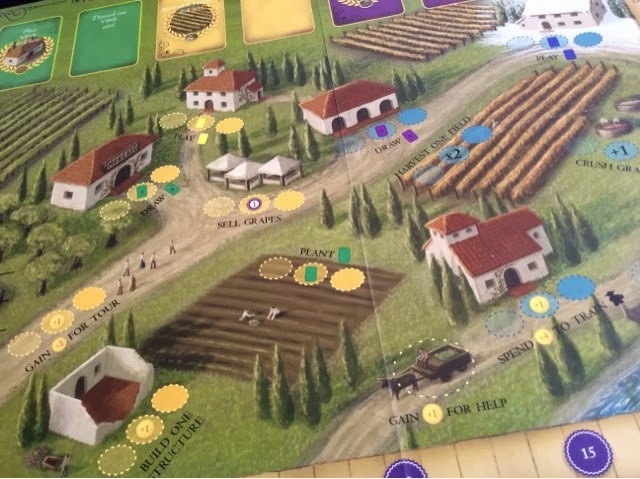 Players take turns in turn order to send their workers to accomplish tasks and eventually attain victory points through fulfilling wine orders, giving tours of their vineyard, planting vines and selling grapes. At the end of the game, the player with the most points is the winner and the one who has showed true excellence in running a winery business ( or maybe all he/she did was run a successful tour agency ). Is Viticulture fine wine in a bottle or merely grape juice in a glass? Let's taste and see! Viticulture plays over a variable number of rounds ( depicted as years ). Each year, the players' actions are divided by the seasons of a year. Players decide how early they would like to wake up. This will determine any special benefits given ( 1 victory point, 1 dollar, more cards, etc ) to the player and will also determine the turn order for the rest of that year. Each player will get a free visitor card. Players will get to choose between taking a Summer or a Winter visitor card. At the end of the year, players will check their hand limit of cards, collect additional income from their fulfilled wine orders, and will age their grapes and wines respectively. This carries on year upon year till the end of game condition is met ( when a player reaches 20 victory points ) which signifies that the current year being played is the last year of the game. Worker Placement in Viticulture works mostly the same as other worker placement games, except that it adds in 2 small twists that really makes the game shine. The first twist in the game is whereby if you are first to a particular action ( and have the means to execute it ) you will receive an extra benefit that late comers don't get. For example, if you were first to sell grapes, you receive 1 victory point and money while the late comers only get money for their grapes. Or when you are first to draw cards, you may draw an additional card. Every spot on the board utilizes this twist and this makes the game very interesting and a real fight to be somewhere before anyone else can. The second twist that Viticulture adds to the worker placement genre is the way it makes you utilize and hold back your workers. Your worker pool in Viticulture is needed for the entire year. Any worker you use in Summer, can't be used in Winter. So you have a decision to make, how many do you commit for use in Summer and how many do you keep for Winter ? If you keep too many, will you be able to get a spot to execute the action you want ? This may be just a small deviation from the normal worker placement aspect in games, but with poor planning, you may just be short of workers or left too many over for what you really hope to accomplish. Viticulture is extremely well produced. A game like this is normally labeled Deluxe Edition and sold at exorbitant prices. 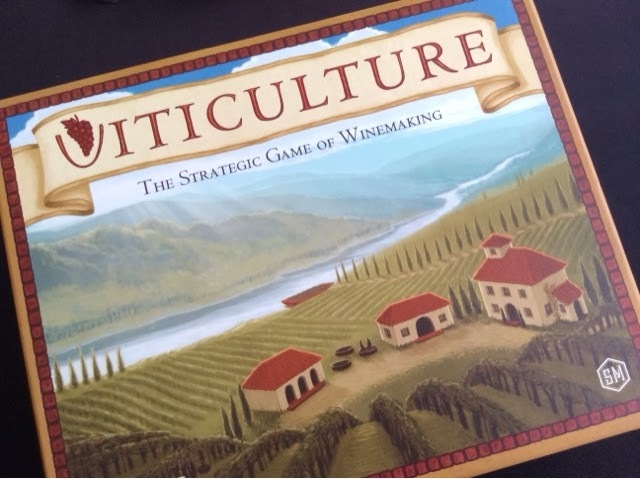 But with Viticulture, you get all the goods of a deluxe edition, coupled with beautiful art, and all at the price of a standard big box game sold at your FLGS or OLGS. Its a marvel how much Stonemaier Games is giving you at the price they are asking from you. 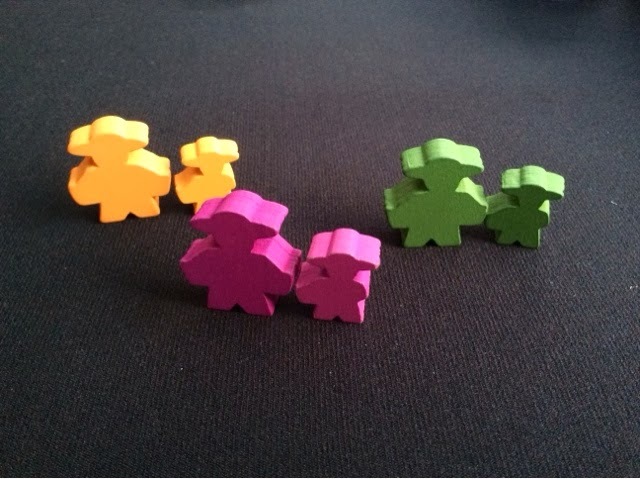 Each structure in the game comes with its own unique wooden piece, the colors of the playing pieces are vibrant and the art is truly top notch. I can't think of any way to improve on the production of the game. 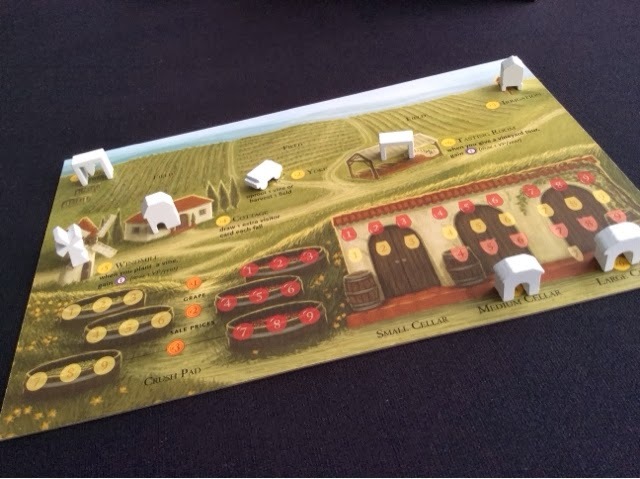 The theme in Viticulture really shines as the actions that you execute really give you the feel that you are working in a vineyard and winery business. Every action makes sense and falls neatly in line with the theme. The process of harvesting grapes and churning them into wine may be a somewhat long process in game, but that's how its like in actuality. So at no point do you find yourself doing something out of the norm or something that confuses you through its implementation. This also helps to makes the game easier to teach. Although Viticulture is a victory point race, how you get there is wide open and extremely flexible. Sure, the best way to score a truck load of points is via fulfilling the wine order cards. But the effort invested to get the wine tokens is a lot and might hold you back from other valuable point scoring opportunities. Points can be gained by selling grapes, giving tours, and smartly utilizing the visitor cards. Majority of the games I have played have been decided by fulfilling more wine orders than the other players, but there have been games where fulfilling 1 wine order was enough and the other points where obtained through clever play. I myself have won a game by mixing up my card play and taking points here and there over the board. I think the waking up turn order mechanic is one of the least used mechanics in games. And that's quite a shame as I like it quite a bit. I liked it in Fresco but I love it much more in Viticulture. Yes going first is usually the best chosen option especially closer to the end of the game. But if you are playing a different strategy from the other players ( perhaps focusing on selling grapes and planting vines for points ), then waking up late at the plus 1 victory point level is the one you will be constantly shooting for. Going first is most certainly important, but with the second edition change where you can use the Grande worker to take an action that is already full, waking up late with a better benefit is now an enticing and possible option. Due to the limited action spots on the board ( its scales according to the number of players ), the gameplay often feels very tight as the competition for the spaces is fierce. Soon after the first year or so, everything on the board feels extremely important and every season ( except for fall ) you will find yourself constantly wanting to be first for everything. Points don't come easy in Viticulture. Sure you may get 1 point here and there for simple actions. But when you finally land that giant 5 or 6 points wine order, there is a great sense of satisfaction that overcomes you. The work is hard but the payoff is deserving of the effort put in. You will truly feel as if you labored hard for the product you had just produced. 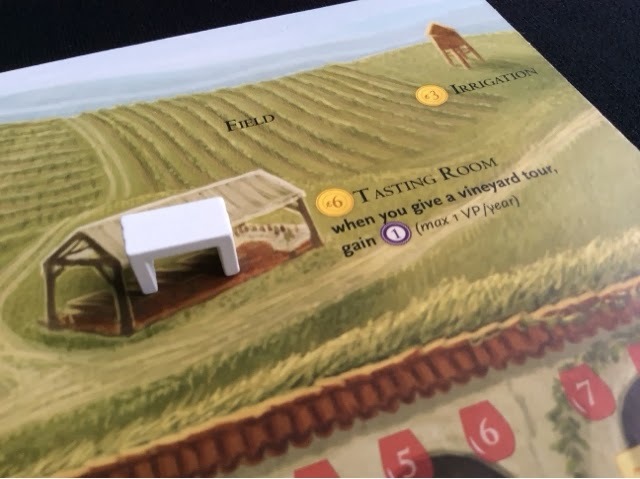 The one major flaw in Viticulture that really irks me sometimes ( most times actually ) is that the abilities of the visitor cards are pretty imbalanced. Some cards are noticeably way better than other cards in the game. This is really not just my observation but also the comments I hear from others who have played the game together with me. During the game when a powerful card is played, you will immediately get a reaction from a player or two at the table about how the card in their hand is nowhere as awesome as the card just played. And even if I don't know what card they have in their hand, I totally believe them. That's how badly I feel about the abilities of some of the cards. Another issue with the card abilities is that they don't scale well from 2-6 players. For example, one card allows each player to train a worker for a discount, for each other player that takes this advantage, the player who played the card gets 1 victory point. So if we go round the table allowing each person to train a worker, the first 3 who take the opportunity to do so will get a worker and the player who played the card will get 3 points, now, assuming a 6 player game, do the last 2 players refuse to do so and deny 2 more points to that player? or do they go ahead to take the advantage given to them? I suspect they will take it anyway since 3 others have done so. So with just simply that one card, the player gets a new worker for himself/herself at a discount as well, plus he/she gets 5 points ( one quarter the points required to reach the end game goal of 20 ). I cannot imagine how that card got by playtesting. It should have been scaled accordingly. ** I gave this point a 1+2 because I REALLY hate this flaw in the game. Really I Do. I talked previously on how the year turn order is chosen ( in Spring ). What I didn't mention is how you decide who gets to choose first in Spring, and that is determined by who holds the grape start player token. At the start of the game, it can be randomly assigned, not a problem. But its how the token gets passed from then on that irritates me a little. The token is passed anti clockwise. So this means that, in a 6 player game, if you started 4th at the start of the game, you will be going 5th on the next turn, and last on the turn after. So you have to wait 3 years to finally get to choose first. This may not sound like a big deal but turn order in Viticulture is EXTREMELY important. In all the 6 player games I have played, I can honestly say the winner was either the first or the second player. The lower half normally had a poorer showing than the upper half. Which is way I will never ever ever play this with 6 players again. Apart from point number 3, another reason I won't play this with 6 players again is that it just simply takes too long. A 6 player game takes easily 3 hours, and as much as I like Viticulture, that is about 1 hour too long. I think Viticulture is best played 3-4 players. This is possibly a small ding on the game, but when everyone plays similarly, you find that each year proceeds the same as the year before. It has happened to me only twice so far, but it was most noticeable in my latest play of it. 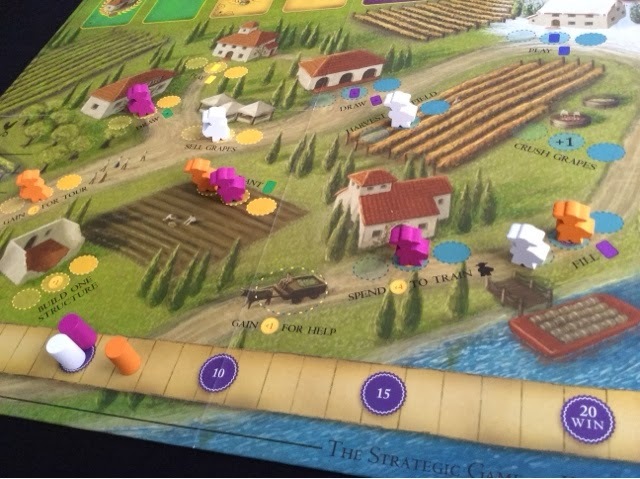 In my four player game, we all went through the last 3-4 years doing the same thing, choose to go first, harvest our field, crush our grapes, and fulfill our orders. We didn't need to do anything else as we were all about 5 points from the finish and within one point of each other. So everyone had a card they were aiming for and it all boiled down to processing our already laid out engine all over again till we got the wines we wanted. It was a sad way to finish the game by doing the same actions but I would say it doesn't always happen this way. The finish was close, so that made it better when all was said and done. At the end of it all, I will say that I am very happy with what Viticulture brought to the table. So much so that I awarded it the 5th spot on my top games of 2013 list. Yes it is not without its flaws, and yes it's one major flaw is something that at times makes me want to rip my hair out, but even then, the gameplay is pretty fine and I like how accessible and immersive the experience feels. If asked to play this game, I would likely never say no, as long as it is played within the realms of a 3-4 player game, and maybe 5 players if I had sufficient time. It's a worker placement game that is very nicely produced and plays just as great. The twists in the worker placement really makes the game stand out and without out it I think the game will suffer a bit in terms of my enjoyment of it. Thanks so much for this review, Jonathan! I can relate to the first flaw. I've said many times: "Draw more cards! ", but when it comes down to it, there's absolutely no reason that some of the cards are imbalanced as they are. Luck of the draw can be exciting, but it should provide interesting choices, not dead ends. I'm indeed very much looking forward to the Tuscany expansion ! If the cards can be revised or properly managed then that would be great ! Will the expansion make the game longer or add much more complexity ? Great review for a great game. I love all the pictures you include and your house rule fixes. Thanks for the review!